put the baked (and cooled) oat cookie, brown sugar, salt, and melted butter into a food processor and pulse until the cookie is broken down and the butter has made the mixture moist (adding another 1-1 1/2 tablespoons butter if needed). alternatively, you can crumble and mix this with your hands, but the food processor works better. using your fingers and the palms of your hands, press the oat cookie crust firmly into a pie plate, making sure the bottom and sides of the pie plate are evenly covered. 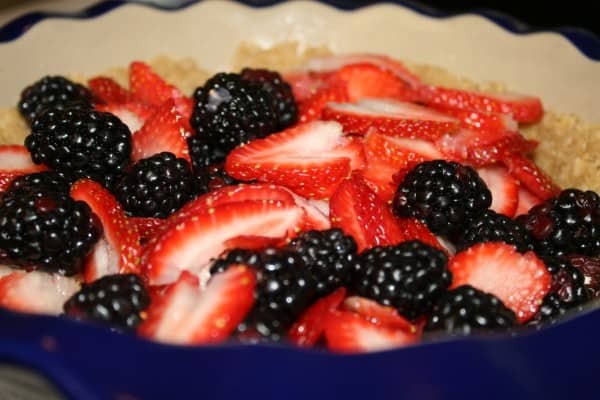 tumble the berries onto the oat cookie crust and top with the crack pie filling. bake the pie in the preheated oven for 15 minutes. after 15 minutes of baking reduce the oven temperature to 325 F and open the oven door for 5 minutes to decrease the oven temp. after 5 minutes, close the oven door and bake for another 10-15 minutes until the pie is jiggly only in the bulls eye center, but not around the outer edges. take the pie out of the oven and transfer to a cooling rack to cool the pie to room temperature (about 30 minutes). once the pie has cooled to room temperature, place in the freezer for at least 3 hours and up to overnight (this condenses the filling for a dense final product). transfer the pie to the fridge to defrost for 1 hour and then serve the pie cold! if not serving your pie right away, wrap well in plastic wrap and keep in the fridge for up to 5 days.